"I have a new name. My name is no longer Aufen" Edith Lewin remembers her former schoolmate Mascha Kaléko telling her. 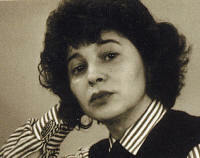 Her whole life she tried to hide her illegitimate birth, her real birthday and her Eastern European Jewish background. Born 7th of June 1907 50km west of Krakau in a small "gossip infested town in Galicia, with a church, two or three doctors and a big insane asylum", she experienced already as a child flight from progroms. At the onset of World War I, the family moved to Germany, where the father was interned as an enemy alien. The mother struggled to bring up her two children. After the war, the family moved into Berlin’s "Scheunenviertel" (barn quarter), then highly frequented by poor Jewish immigrants from Eastern Europe. The father tried to maintain his family working as a trader. Mascha visited the Jewish school for girls. Later she started a vocational training at the "Arbeiterfürsorgeamt", an institution of Jewish social work giving special attention (councelling services) to new Jewish immigrants from Eastern Europe. In her free time she educated herself in psychology and philosophy and started to write poetry. 1928 she married the Hebrew teacher Saul Aaron Kaléko. From 1929 on, she published biting poetry presenting the daily life of the common people in the newspapers "Vossische Zeitung" and "Berliner Tageblatt". In her poetry she catches the atmosphere of Berlin in the 1920’s. Quickly she attained fame and frequented places like the famous "Romanisches Café", where the literary world met, among them Erich Kästner and Kurt Tucholsky. 1933 she published her first book with poetry "Lyrisches Stenogrammheft", and two years later her second "Das kleine Lesebuch für Grosse" with the editorial Rowohlt. 1938 she married director and music theorist Chemjo Vinaver, the love of her life, after having divorced from her first husband. A bail deposited by the Warburg family enabled the Vinavers and their young son to leave Germany and to emigrate to the United States. Mascha earned their living writing texts for advertisement. In addition she tried to support her not so practical husband into building a new career for himself. But their hopes of a possible career in the field of film music were crushed and the family returned to New York after a short intermission in Hollywood. The difficult life of a migrant deployed Maschas meagre health. The experience of uprooting changed the tonality of her poetry. Accusations, bitterness, yearning for the lost home and also religious motives can be found in her writings of that period. 1956 she returned for the first time to Berlin. Four years later she was supposed to receive the Fontane prize, which she declined since it should have been handed over by a former Nazi official. Since her husband, researching on Hassidic singing, had better working conditions in Israel, the couple migrated that same year to Jerusalem. Mascha lacked knowledge of Hebrew and was thus completely isolated. While famous in Germany and well known in America, nobody had ever heard of her work in Israel. Two years later her son died suddenly in New York and in 1973 her husband followed suit. After a long time of silence, she started to write again. But it was to be her last year of life, which came to an end while travelling through Europe 1975. She is buried in the Jewish cemetery in Zurich (Switzerland).